Based in London, we specialise in providing home owners and commercial businesses from throughout Kent, London and the Home Counties with the very best in building, property maintenance and roofing services. Our service is based on absolute quality. The standards we set, and meet consistently, the quality of our work and the dedication of our talented builders are the reason why we have become one of the leading names in building and construction throughout the South East of England. Our builders have been working in the domestic and commercial building and construction industry for over 18 years. Working on a number of different conversion, extension and refurbishment projects throughout the South East, our fully trained and highly skilled builders work to deadline and budget and guarantee exceptional building quality, no matter how challenging the requirements. We take customer service incredibly seriously. 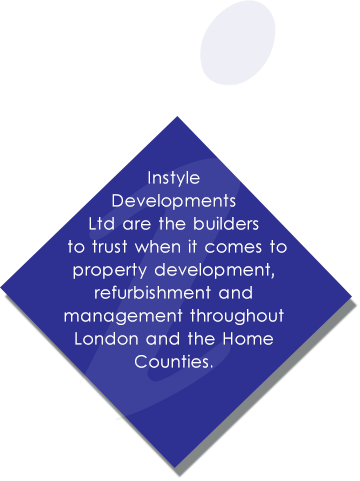 The owner of Instyle Developments, Paul Fletcher personally oversees every building and property maintenance project to ensure that our exceptionally high standards are met. You will always deal with the same person during your building project, ensuring easy communication and complete customer satisfaction at all times. Every one of our builders is expected to wear our customary uniform with emblazoned company logo. We expect every one of our team to look the part, as well as provide absolute quality in everything they do. You will find all our prices to be fair and reasonable. We don’t believe in charging our clients the earth for any building, cleaning or property maintenance services. As professional and safety conscious building and property maintenance specialists, we take health and safety very seriously. We operate to a very strict health and safety policy and every project is overseen by our experienced project managers to make sure our quality and safety standards are met at all times. As a company, we are also members of the FMB and the European Builders Confederation, guaranteeing you absolute quality in everything we do. Located in London, we work throughout the South East, including in Kent, London and the Home Counties, providing the finest building and property maintenance services to domestic and commercial clients. We have recently completed projects in Kensington, Bromley, Croydon, Putney, Colchester, Stratford, Guildford, Watford, Stevenage, Islington, Enfield, Romford, Victoria, Reigate, Redhill, Greenwich, Lewisham, Chelmsford, Orpington, Chelsea, Slough and Barnet. For more information about our building, construction and property maintenance services, please do not hesitate to contact us today. One of our friendly team will gladly answer any questions and arrange your free site survey and no obligation quotation.